The other day my neighbor made mention of how cute it was that my husband and I are typically both standing in front of our grill during the week making our dinner. Together. My husband replied that he needed to be there so that he could oversee if I was using the grill properly. He was joking, of course, but I made sure to interject that just because I was a woman did not mean that I was not a master of our grill. And then huge flames erupted from our grill as I lifted my arms and declared myself the Ultimate Grill Master. Okay, the second part of that didn’t really happen. But the image of me at my grill with a giant metal spatula flipping burgers should certainly empower you to become your own grill master! I was super excited last week when a cute little Weber® Q® 1200 ™ showed up at my doorstep and could not stop my mind from running through all of the things that I wanted to use it for! My first thought was chicken kabobs with a sweet marinade so I settled on chicken kabobs inspired by tropical Hawaiian weather. The combination of sweet pineapple and zesty red onion sounded like the perfect way to bring out the sunshine on my grill. I love that the Weber® Q® 1200 ™ is the perfect grill for camping and tailgating but also is an excellent size for grilling for your family and friends at home. 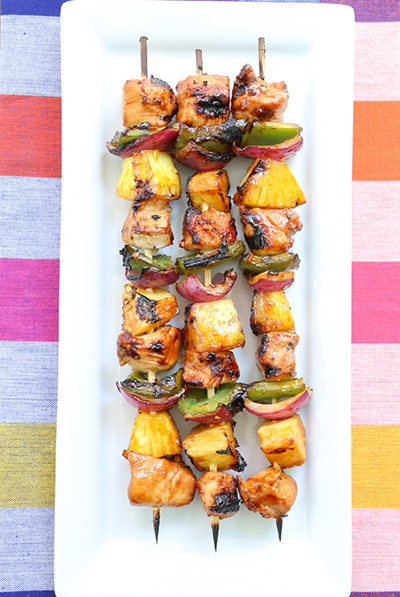 You can easily make my Hawaiian Chicken Kabobs for dinner tonight and show your family that you are the ultimate grill master. 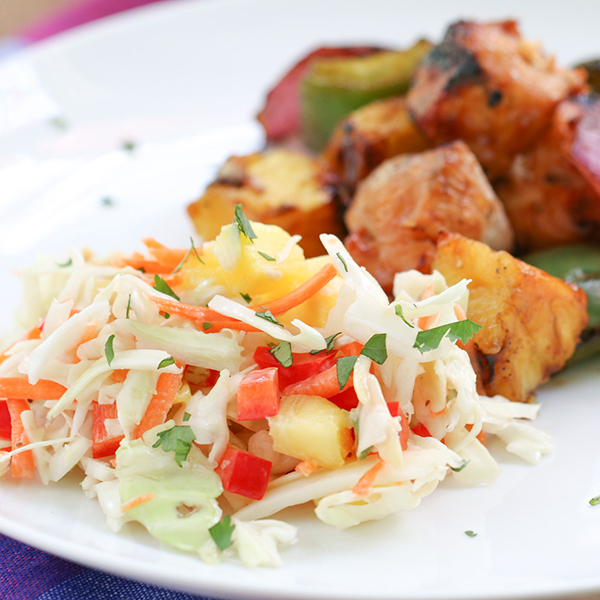 Serve these kabobs alongside of my delicious Tropical Coleslaw for the perfect pairing. Be sure to head on over to the Litehouse Facebook page for your chance to win big! Weber Grills and Litehouse are teaming up and giving one lucky reader a chance to win their very own Weber® Q® 1200™ and a year’s supply of dressing! AND make sure you head over to Food n’ Focus for a second chance to win a shiny new grill. That’s TWO chances! If that doesn’t empower you to be the ultimate grill master, I don’t know what will! 1. In a mixing bowl whisk together ketchup, brown sugar, soy sauce, pineapple juice, 2 tablespoons olive oil, rice vinegar, garlic, ginger and sesame oil. Stir in 3/4 teaspoons pepper and season with salt if desired. 2. Place chicken in a gallon size resealable bag. Reserve 1/2 cup of the marinade in refrigerator then pour remaining marinade over chicken. Seal bag and refrigerate 1 - 2 hours (meanwhile soak 10 wooden skewer sticks in water for 1 hour). 3. While the chicken marinates, prepare the coleslaw. Toss together all ingredients for coleslaw in a medium bowl and refrigerate until ready to serve. 4. Preheat a grill over medium heat for 10-15 minutes, or until the grill reaches 400 degrees. Meanwhile, drizzle remaining 2 tablespoons olive oil over red onion, bell pepper and pineapple and toss. 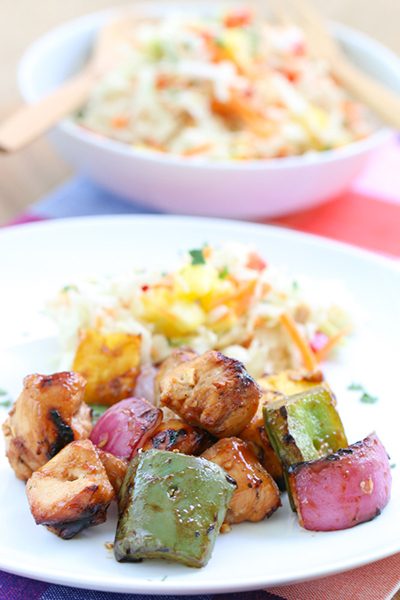 Season red onion and bell pepper with salt and pepper, then thread red onion, bell pepper, pineapple and chicken onto skewers until all of the chicken has been used. 5. Lightly brush each skewer with olive oil to prevent it from sticking to the grill. Grill 5 minutes then brush along tops with 1/4 cup of remaining marinade. Rotate to opposite side and brush remaining 1/4 cup of marinade on opposite side and allow to grill about 5 minutes longer, or until chicken registers 165 degrees in center on an instant read thermometer. 6. Serve warm with coleslaw. Adapted from: April Preisler. Visit April at her blog, www.foodnfocus.com. Winter Weber Grilling: It's a 365 Thing.